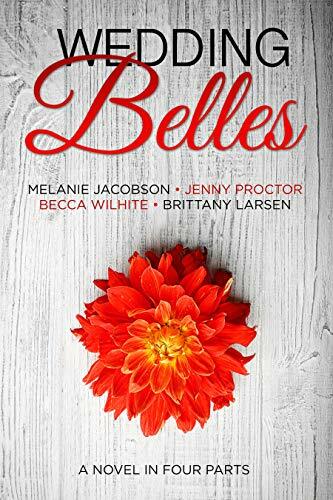 WEDDING BELLES: A NOVEL IN FOUR PARTS by Melanie Jacobson, Jenny Proctor, Becca Wilhite, and Brittany Larsen. Well, this was a fun read. A novel in four parts is what the title says, but I took it more as four novellas with interweaving characters. It was fun to see some of the minor characters in one part become main characters in the next. I found myself wondering whom the next story would be about. I loved most of the characters and their story lines. I loved being able to experience the story through different authors, and I found myself wanting more from each of them. 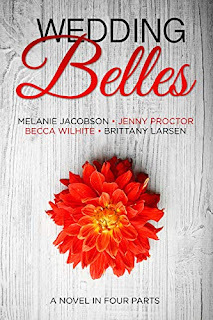 This is a fantastic collection of clean, romance stories that anyone who loves weddings, their mishaps, and romance would adore. I'd recommend this to anyone. A clean and wholesome romantic comedy told in four parts. Harper is an event planner with dreams of taking over the Charleston wedding scene . . . until she meets the biggest Bridezilla of her career. She needs the job, but the only way to keep it is to hire a temperamental chef with big dreams of his own. Can Zak’s passion for brilliant food save the wedding? Or will the sparks flying between Harper and Zak burn them both? Janie is a classical cellist booked to play a posh Charleston wedding. She’s excited to have the lucrative gig until the groom’s brother, Emmett, shows up and asks her to help him play a song he wrote for the happy couple. The only trouble? Emmett is her former high school crush and never did anything but ignore Janie. When chemistry sizzles between them, will Janie have the courage to move beyond past hurts and embrace an unpredictable future? Lily has been Dahlia's best friend, partner-in-crime, and now her maid of honor . . . until suddenly there's no wedding, and she's left to clean up Dahlia's biggest mess of all. She's been friends with Deacon, the jilted groom, for just as long, and it's up to her rescue him after Hurricane Dahlia blows through. But as their friendships deepen, so do their feelings. Can she trust their growing chemistry, or is this another disaster waiting to happen?